A former geology professor at UBC who collected bottles and cans for 25 years left $1.1-million to support geology students at UBC. 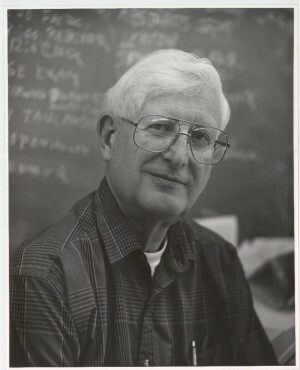 Wilbert R. “Ted” Danner began teaching geology at UBC in 1954 and established the Beer-Pop Can-Bottle Deposit Refund Award in 1989 using proceeds from the return of bottles and cans collected on weekly scavenging treks on UBC’s Vancouver Campus. Danner’s office was often full of cans ready to be taken to the recycling depot. He raised $46,000 from collected bottles and cans to support students before he passed away in 2012. He chose to name it the Beer-Pop Can-Bottle Deposit Refund Award to show that, over time, even small contributions can have a big impact. The Beer-Pop Can-Bottle Deposit Refund Award has continued after his death and has benefited 53 students so far. A trophy made by students from empty cans and bottles is still awarded to each year’s winner. Matthew Topham received the award in 2013. He says he found Ted’s story inspiring and it gave him more of a connection to the history of the geology department at UBC. Danner’s bequest endows $320,000 for the Beer-Pop Can-Bottle Deposit Refund Award, which provides two awards annually to geology students who have demonstrated aptitude in fieldwork. Another $320,000 funds the newly established Ted Danner Memorial Entrance Bursary in Geology, provided to a student entering UBC enrolled in at least one geology course. The estate also includes Danner’s extensive mineral collection, which now resides at UBC’s Pacific Museum of the Earth. It contains more than 2,000 specimens and is worth more than $500,000. “Ted Danner cared deeply about UBC and his generosity will continue to benefit students here, and at high schools across the Lower Mainland, for years to come,” said UBC Dean of Science Simon Peacock.